When I was still working as a software engineer/developer, I have learned the skill of doing temporary fixes. When we encounter system/application issues and we could not find the root cause of the problem, we implement a work around just to reduce the issues until we figure out the root of it. And sometimes, we end up not fixing it. It’s not ideal but we just learned to live with it. The world we are living in has been like that. We put band-aids to everything that becomes a moral issue in our society to reduce the noise until everyone will just learn to accept it. I’m not sure what your belief is. I’m a Christian and I believe everything that is written in the Bible. Everything not good that is happening anywhere in this world does not come as a surprise to me anymore since I became a follower of Christ. God gave that warning during the early days of the church. If you ask the question, “Why would God allow such things if He is really real?” I would like you to watch the video that hopefully will encourage you to seek God more. Why did this become a need to implement? What is really the main reason? When I was still in grade school, my father never failed to remind us the importance of education. He required us to study so hard, get good marks because he believed that we are capable. That’s just one of the many things of the role of being a parent. They disciplined us, they taught us how to behave properly as a girl and as a boy, they taught us how to dress properly, they taught us the right values. Because they are parents, they are responsible in helping us build a good foundation of our lives. The struggle of kids on their sexuality, on bullying, on suicide – these are not issues that should be primarily “resolved” in schools. These are issues that need to be tackled within the family. If a child is reported to be bullying someone, it is the responsibility of the parent to talk to that child and correct that child. If a child is struggling with his/her sexuality, it is the responsibility of the parent to help that child overcome that struggle. If a child has suicide tendencies, it is the responsibility of the parent to assure that the child is loved no matter what. The problem with our society, some of the parents have lost their authority over their children. The society has more authority now over these kids than their parents. SOGI is a band-aid. It is a work around that will never give a permanent solution. It will probably reduce bullying or suicide attempts but it will also cause more problems in the future for the young generation. There is only one FIX for all the problems of this world. That fix was rejected 2000+ years ago up unto now. Just like anybody, I have my own struggles and problems in life. It may not be the same as the struggles on sexuality or bullying or depression but they are also real struggles in life. However, I chose the permanent FIX and not just a band-aid. I chose JESUS to FIX my life and not what this world wants to offer. If you are a parent, choose what can really help your children so that when they grow up, they have a strong foundation that will help them overcome trials and challenges in this world. They need a foundation that will NEVER BE SHAKEN. And that’s only through a relationship with Jesus – the ONE who promised a life that is full and abundant. I am not a parent but I care so much for the young generation that it breaks my heart that they will be brought to a knowledge that will just add more confusion to their young and innocent minds. The verses below show the heart of Jesus for the children. Before the parents loved them, Jesus already did even before they were formed into their mother’s womb. He knew them and He designed them with a life that is meaningful and purposeful (Psalm 19:13-18). I hope that we pray for the young generation that they will experience the love of God through His Son Jesus who alone can assure them of their true identity. I hope that we pray for parents and families who are going through these struggles and challenges that they will experience the transforming power of Jesus. Last night, my roommie knocked at my door telling me she has something for me. 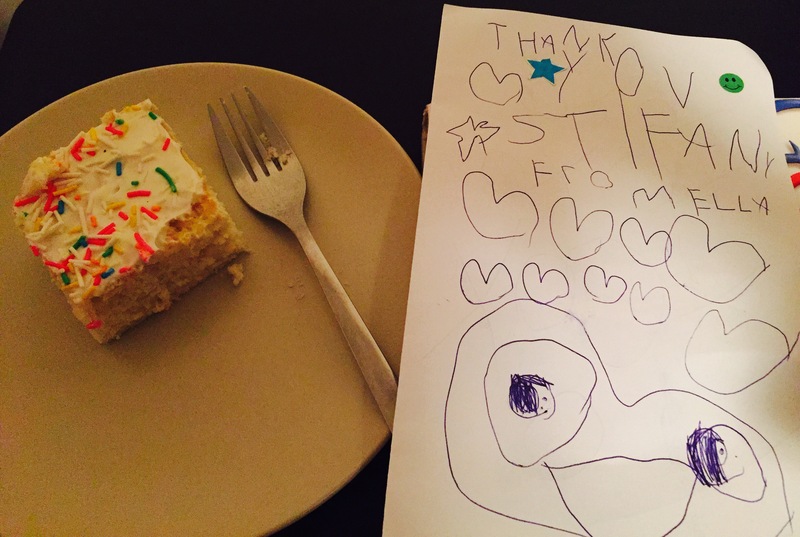 It’s amazing how kids are so appreciative at an early age. I get a lot of thank you’s from kids for even just the little things I give to them. I must say, good job to the parents!